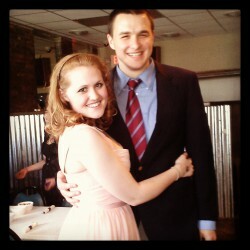 My family and I are HUGE Steven Kellogg fans. He seriously wrote sooo many fantastic children's books. I actually have a signed copy of The Island of the Skog. 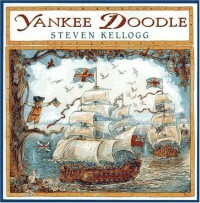 So when I selected the American Revolution as the subject of my topic project for my Resources for Children's class, I knew that Steven Kellogg's adaptation of Yankee Doodle had to be my pre-reader text! This book is so great because it takes the traditional lyrics of the American folksong "Yankee Doodle" and accompanies them with illustrations by Kellogg. These illustrations are hysterical and really bring new life to the lyrics. This also means that this book serves as a great tool for introducing young children to the concept of the American Revolution. This book is very basic, but from it, children will learn that once upon a time a long time ago, an American army fought a British army and won, which led to the birth of our great nation. This is, of course, an extraordinarily simplified view of the conflict, but pre-readers do NOT need to know all of the political details - they just need the basics. This also takes an extremely light view of war - the concepts of death are very abstract and fleeting, which means that children won't be alarmed. I would recommend just about any book by Steven Kellogg to read at any time because, again, they're just awesome. But if you're looking to introduce a pre-schooler to the American Revolution, look no further than Yankee Doodle - this will work perfectly.